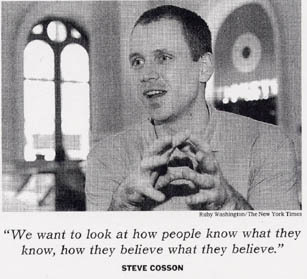 Steve Cosson has a mini-profile in today's NYTimes. He was drawn not only to theater as a child but also to directing, getting his parents to act out bedtime stories. He and a playmate in elementary school wrote a play about Persephone's fall into the underworld. He wrote a play for his second-grade class. By third grade, he had won a playwriting competition sponsored by Children's Radio Theater in Washington, not far from his childhood home in Potomac, Md. "It was agitprop," he said. "It was about an albino eagle whose parents die from DDT poisoning. But they wrote music for it and it was broadcast. It was the coolest thing that happened to me by the age of 8." He plunged into the usual world of high school theater, although he acknowledges he is a mediocre actor. He perished on stage as Mercutio in "Romeo and Juliet." "I acted my heart out," he said. "Unfortunately, there was no way that scene was not going to evoke gales of laughter among my high school classmates." He was in three productions of "The Music Man." But by college, convinced that life in the theater was a hobby, not a passion, he was studying to be a biologist. Unfortunately, he said, he went to Dartmouth, a place where he felt on the margins of campus life. "I did not know there were people my age that actually supported Ronald Reagan," he said. "It was the height of the culture wars. I had no idea what this New England prep school thing was about. I was confronted with a narrow elitism that drove me back into the theater. By sophomore year, I was a theater major." Steve remains as thoroughly committed politically as he is committed to theatre - but not as an actor, even if he's as much a delight to look at as he is to listen to. If you don't have the print edition, you'll miss out on the photograph which accompanies the article. Steve's a beautiful and amazing phenomenon, but the Times piece hardly begins to describe the incredible theatre company which now gives expression to his energy and creativity. How many people would pick the shockingly-radical failed social and political phenomenon of the 1871 Paris Commune as a subject for a musical and still be able to retain the integrity and good conscience of the history? The Civilians performed the delightfully gentle and eccentric play alluded to in the closing lines of today's article, "Canard, Canard, Goose." An audio clip is available here. 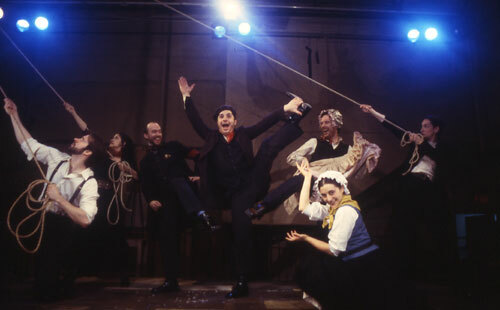 Barry and I are crazy about these people and this company, and we both shun traditional "musicals" like the plague. This is more than a recommendation; this is unconditional love. "Gone Missing" opens October 9 at the Belt Theater in New York. \n\n\nSteve Cosson has a mini-profile in today's NYTimes. He was drawn not only to theater as a child but also to directing, getting his parents to act out bedtime stories. He and a playmate in elementary school wrote a play about Persephone's fall into the underworld. He wrote a play for his second-grade class. By third grade, he had won a playwriting competition sponsored by Children's Radio Theater in Washington, not far from his childhood home in Potomac, Md.\n\n\"It was agitprop,\" he said. \"It was about an albino eagle whose parents die from DDT poisoning. But they wrote music for it and it was broadcast. It was the coolest thing that happened to me by the age of 8.\"\n\nHe plunged into the usual world of high school theater, although he acknowledges he is a mediocre actor. He perished on stage as Mercutio in \"Romeo and Juliet.\"\n\n\"I acted my heart out,\" he said. \"Unfortunately, there was no way that scene was not going to evoke gales of laughter among my high school classmates.\"\n\nHe was in three productions of \"The Music Man.\" But by college, convinced that life in the theater was a hobby, not a passion, he was studying to be a biologist. Unfortunately, he said, he went to Dartmouth, a place where he felt on the margins of campus life.\n\n\"I did not know there were people my age that actually supported Ronald Reagan,\" he said. \"It was the height of the culture wars. I had no idea what this New England prep school thing was about. I was confronted with a narrow elitism that drove me back into the theater. By sophomore year, I was a theater major.\"
Steve remains as thoroughly committed politically as he is committed to theatre - but not as an actor, even if he's as much a delight to look at as he is to listen to. If you don't have the print edition, you'll miss out on the photograph which accompanies the article.\n\nSteve's a beautiful and amazing phenomenon, but the Times piece hardly begins to describe the incredible theatre company which now gives expression to his energy and creativity. How many people would pick the shockingly-radical failed social and political phenomenon of the 1871 Paris Commune as a subject for a musical and still be able to retain the integrity and good conscience of the history? \n\n\n \n\"Paris Commune\" \n\nThe Civilians performed the delightfully gentle and eccentric play alluded to in the closing lines of today's article, \"Canard, Canard, Goose.\"
An audio clip is available here. \n\n\n \n\"Canard, Canard, Goose\"\n\nBarry and I are crazy about these people and this company, and we both shun traditional \"musicals\" like the plague. This is more than a recommendation; this is unconditional love.\n\n\"Gone Missing\" opens October 9 at the Belt Theater in New York. Published on July 29, 2003 12:11 PM.